As the Tie Dye Diva, I created and sold my boutique-style tie dye for years. My shop was a success, but when I hung up my dye-splattered apron for the last time to focus on sewing patterns, I created this ultimate guide with tips for tie-dyeing. You’ll learn the basics of tie dyeing from choosing tees, folding, tying, mixing dyes and creating custom colors, to applying the dye and curing and washing out. I’ll show you step by step how to create three of my most popular tie dye patterns: perfect boutique hearts, Best Friends rainbow tees, and now, spirals too. You’ll learn how to get that perfectly shaped heart, how to control stray splatters and bleeds, and how to cure and wash out for a bright, bold, long-lasting effect. The Best Friends tees were a best seller for me, and I share exactly how to make this adorable matched set of rainbow tees with you. Just like my sewing patterns, this 28-page PDF tie dye tutorial is full of step-by-step full color photos and helpful explanations and tips. A computer-drawn template is included, as well as a section on where to buy dyes and chemicals (it doesn’t have to be online!) and variations you can create using the methods you’ll learn when creating hearts and rainbows. What you’ll need: This tutorial is for creating professional grade tie dye with fiber reactive (Procion MX or Procion MX-type) dyes. They won’t fade, run, or bleed when you are done. You will also need some other ingredients for the reaction, like soda ash, which you can buy at a hardware or pool supply store or pool supply section of a big box retailer. Almost everything else you already have at home. I’ll tell you how to use dyes and chemicals safely, and how to get beautiful results. I do not recommend that you use RIT or other craft kit dyes with these techniques. You’ll receive your tie dye instructions in .pdf format by email immediately upon purchase, and will need Adobe Reader to view it and a printer if you wish to print the ebook or template. No paper copy will be mailed. 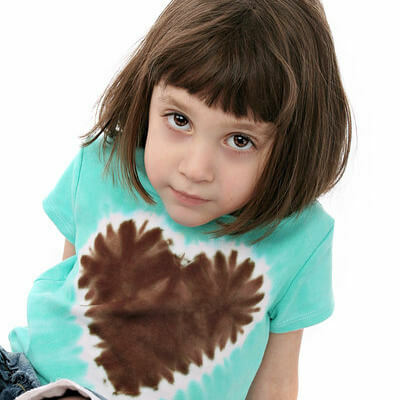 You are not purchasing an actual tie dye item or a kit, but a PDF file that teaches you how to tie dye your own heart and rainbow tees. You are welcome to use items produced using the information in this eBook for personal use or for resale without restriction. I’d love to see and share what you make!